Milwaukee Daily Photo is on vacation, and you're invited along! Today, we went to the Brewers - Padres game in Maryvale, which ended in a 10-inning, 10-10 tie. 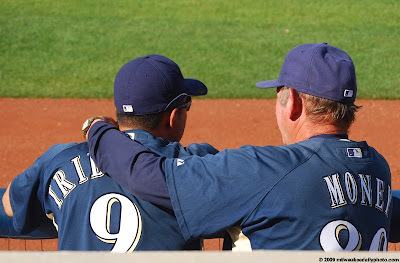 It was fun to be at a spring training game, and see the interaction between coaches and players. In this photo, coach Don Money was taking some time to have a discussion with Hernan Iribarren. I don't know what they were talking about, but they both seemed to be having a good time.